Combating Black Mold in Washington, D.C.
Black mold rapidly colonizes a Washington, D.C. laundry room. Black mold threatens Washington, D.C. homes along with the torrential rains expected through this coming weekend. Any time nature delivers soaking rains over an extended period of time homes, apartments, and businesses are vulnerable to potential property damage and health problems associated with the rapid proliferation of black mold. Washington, D.C. residents need to be alert to the conditions that support black mold growth, how to identify black mold, and when to call for professional black mold remediation. As multiple storm systems, which may include the late addition of Tropical Storm Joaquin, converge on the Eastern United States, the stage is set for increasingly more intense rounds of significant flooding in Washington, D.C., and Virginia into next week. These converging factors will lead to heavy rainfall, possible flooding, and perfect conditions for black mold to infiltrate Washington, D.C. properties. Abundant tropical moisture means excessive rainfall and strong gusty winds, a one-two combination that could force floodwaters into low lying areas and into buildings prone to flooding. What appears to be a minor spot at first glance, could be a red flag for serious hidden water damage or health concerns from a black mold infestation. Washington, D.C. residents, property owners, and businesses need to be vigilant and contact the mold removal experts at Envirotex at the first signs of mold growth. Fungus stachybotrys, or black mold, produces mycotoxins. Exposure to black mold elevates susceptibility to asthma, coughing and wheezing by 30%-50%. Black mold exposure is also linked to bronchitis and respiratory infections. In 2004 the Institute of Medicine (IOM) found evidence linking black mold exposure in Washington, D.C., to upper respiratory tract symptoms including asthma and hypersensitive pneumonitis in vulnerable populations. The key to eliminating symptoms is controlling indoor moisture. 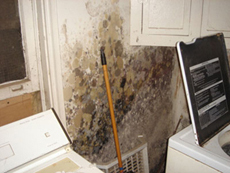 Are you facing black mold in Washington, D.C.? Waste no time contacting our experienced environmental services company. Envirotex has the credentials, expertise, and know-how to eliminate your black mold problem for good. Protect your home and family, call Envirotex today.